This is not organized yet, but we have started to upload some information that is either related to our December trip, obtained during the trip or has been obtained or organized since this last trip. MAP showing Settling in America and westward movement of original Norwegian Sloopers, Jacob Anderson SLOGVIG and his wife, Serena Tormodsdatter MADLAND (NY-IL-IA-CA). Tysvær (7 volumes) - the new Volumes 6 & 7 (Nedstrand area) were gifts received during our Dec. trip. Gjestal (Gjesdal) (Arneson's 1939 book) - a gift from the Gjesdal History Group in 2000. Vats, Vindafjord (Soga om Vats, 1984) - a previous gift from the Slogviks. Notes on Keith's great great granduncle, Anders Anderson Slogvik (1812-1891), from interview with Kåre Slogvik, 12/26/2001. Kåre Slogvik (b. 1935) is a 1st cousin to our dear friend Einar Slogvik. Kåre lives on Bruk 1 of the Slogvik farm where he was raised and where he has farmed for many years. Dec. 31, 2001 (just hours after we left Norway) - Einar Slogvik searches the microfilms of the Skjold church records from 1811 to 1825 in the Stavanger library for Jakob Anderson Slogvik's confirmation. Conclusion: Keith's great great grandfather, Jakob Slogvik, was NOT confirmed! This fits with other indications that he was an early religious dissident. 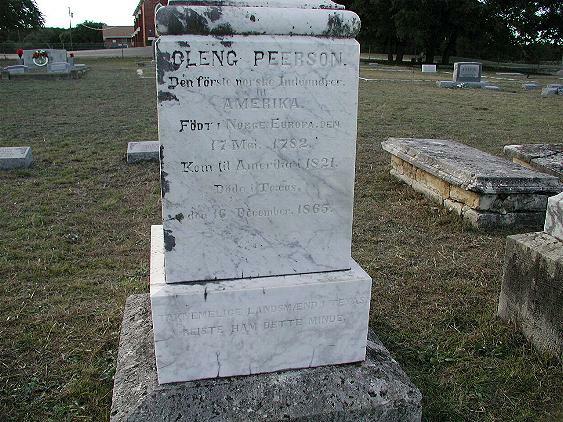 Photos of Cleng Peerson's headstone, Bosque County, Texas. 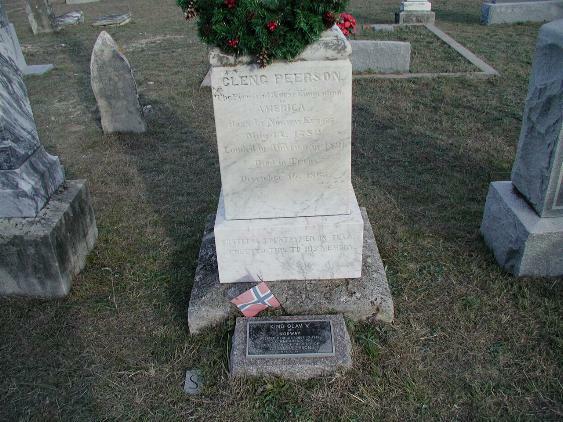 Cleng (1783-1865) was from northern Rogaland fylke (county). He was advanced scout and one of the leaders of the historic immigrant group that came to America in 1825. Among many other honors, he has been called "The Father of Norwegian Immigration" and "The Pioneer of Norse Emigration." These photos were sent to us by Norway List Member, Melissa Aars, of Texas. Headstone photo #1, #2, #3 and enlargement of King Olav V plaque. We also learned at the Tysvær history group meeting that Cleng was born on the Lervik farm about 15 km south of Aksdal instead of the Hesthammar farm, as many historians previously thought. He moved to the Hesthammar farm (just east of Lervik) with his family when he was one year old and there he was raised. Cleng is Keith's 3rd cousin 5 times removed. Maybe in the future we will try to build a Cleng Peerson page to collect some more pictures related to this prominent man. For now you can find photos of an original portrait of him at our Day 7 photo album of our 2001 trip and photos of his 2 Tysvær monuments on our Photo Album 22 of our Summer 2000 trip. "Emigration Exhibition - page 1" from Stavanger's Norwegian Emigration Center's site. Chapter "III. 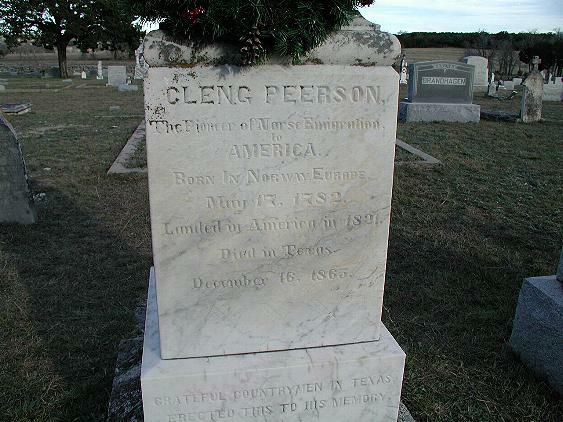 Cleng Peerson" from Hjalmar Rued Holand's Norwegians in America: The Last Migration, 1978, has been made available at "The Promise of America" web site (good overview of reasons for emigration, the voyage of the Restoration, early Slooper settlements and the role played by Cleng Peerson). The Norway Post Cleng Peerson page. The page about the Scandinavian Settlement in Bosque Co., Texas, and the Old Rock Church connects Cleng's life to his eternal resting place in Texas. 4. Slooper Jacob Anderson Slogvik and Cleng Peerson are 3rd cousins 1 time removed. 5. "Quaker Pioneer" Torbjørn Knudson Svinali is Keith's 4th great granduncle. 6. "Quaker Pioneer" Torbjørn Knudson Svinali was a granduncle of Slooper Jacob Anderson Slogvik. For details on these relationships, CLICK HERE. Jeg har sjelden vært på et praktfullere sted enn Slogvig. The above is a quote from the book given us after the Stavanger Quaker meeting. This was "cousin" Martin Nag's Lys over Lars Hertervig og kvekerne i Tysvær, 1995. This quote comes from page 96 and is a statement made by Quaker Joseph Crosfield in a letter home after visiting the the Slogvik farm in the summer of 1868. We heartily agree with Mr. Crosfield! English translation of History of Early Quaker activity in Tysvær kommune - from Svein Ivar Langhelle's local history book, Tysvær 9. Slik levde dei. ("Such as They Lived") FRÅ 1820 TIL1920, pages 178-189, translated by Rotraud Slogvik with help from Peggy & Keith Wheeler. Information is given here not only about the general religious climate in the Tysvær area prior to the 1825 emigration to America, but specific information is given about Keith's 2 great great granduncles, Knut Anderson Slogvik and Anders Andersen Slogvik, and Keith's 4th great granduncle and "the Quaker pioneer," Torbjørn Knudsen Svinali. Information on other important early Tysvær Quaker dissidents is given. We received several fascinating books and other written material, most in Norwegian, during our recent visit. We hope to summarize some interesting bits of historical information from these in the future. We are working on gaining the required permission to upload an English translation of some very interesting historical writing about the early Quakers from the Tysvær kommune area of north Rogaland (very early 1800's).